For over a decade, Couture De Bride has been creating luxurious wedding gowns for brides worldwide. Couture De Bride and its head designer, Tova Marc, has been featured in dozens of Media outlets, from Magazines to TV. Our goal is to make sure that each and every bride is thrilled with her gown. In 10 years, we’ve never had an unhappy bride. 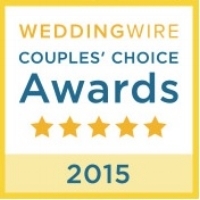 We are proud to be 5 Star Rated by Wedding Wire, 5 Star Rated on The Knot, Couple's Choice Award Winner from Wedding Wire for 2017, 2016, 2015 & 2014 and the winner of “Best Bridal Salon” by 201 Magazine. All of our gowns are created with a Couture construction. Our gowns are fully lined, boned, interfaced with bust support. We work with the finest European fabrics including Satin, Taffeta, Lace, Organza, Chiffon, Mikado, Alencon & Chantilly Lace and so much more.